News by Britta S. and Trent P.
The first is a collaborative effort between Canadian based developer Snowman and LA based The Game Band. Snowman has previously worked on Alto’s Adventure, while The Game Band is a brand new studio. Where the Cards Fall is a coming of age story for the modern age. The developers promise the game will explore how our most fragile memories of the past can become the strongest foundations of our future in this dreamlike title. With the biggest pull to this title been the whimsical imaginative puzzle solving technique of building house of cards, which will form and shape the world. The plot will focus on adolescence memories brought up in a vivid almost surrealist setting. If this game has peeked your interest, it has been announced for iPhone, iPad, Apple TV, and Mac. While the game release window was previously 2017 the developer has narrowed it down to later this year in the autumn. Snowman has also announced a sequel to Alto’s Adventure, an endless runner snowboarding video game released in 2015. The sequel has been penned the title of Alto’s Odyssey and a teaser trailer has been released for the game. The previous title Alto’s Adventure was inspired by titles like Journey and Monument Valley. With the art style and atmosphere praised, the game was favourable by reviewers. It is expected that the developer would capture the same charm as the original in the upcoming sequel. At this stage, no further information has been released bar the reveal of the games release window during the summer. While no platforms have been announced, Alto’s Adventure released on iOS, Android, and Kindle Fire. Rogue Legacy developer Cellar Door Games has announced Full Metal Furies for Xbox One, Windows 10, and Steam. We reviewed Rogue Legacy both for the Vita and the PlayStation 4. Cellar Door is describing Full Metal Furies as an action-packed RPG-laden brawler for up to four players. The game represents the developer's attempt to modernise the brawler genre. It is coming to Xbox One and Windows 10 this year with full Xbox Play Anywhere and Cross Play support, as well as online and offline co-op. "Full Metal Furies was designed to support true cooperative gaming so it’s not just players sharing the same screen. A special 'barrier system' means certain enemies can only be damaged by certain players, forcing teammates to communicate and work together. If an ally falls you better pick them up, because those barriers don’t go away. And this isn’t just for people playing with friends. Single player mode features a quick-swap system that allows you to choose two classes while going solo. Everything you do with your friends you can do alone, like stringing elaborate team combos." The latest issue of Weekly Famitsu brings news of VOEZ, a mobile rhythm game by Rayark (known for Deemo and Cytus) coming to the Nintendo Switch. Flyhigh Works is doing the publishing; at this stage we have no details yet about if the title is coming West. VOEZ is a free-to-play title on smartphones and offers new tunes on a monthly basis. The story revolves around the eponymous band VOEZ, comprised of six high school boys and girls, following their music dream. Matt awarded the mobile version 4.5 stars. We think the Switch's touch screen will be a good match for VOEZ's gameplay style. Development is currently 99 percent complete and VOEZ will launch in Japan in March. 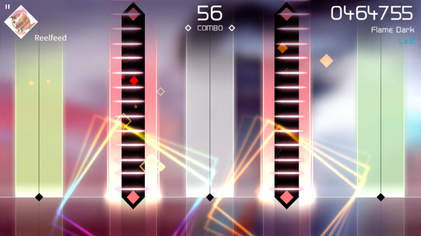 The game features over 100 songs across various genres from Taiwanese and Japanese creators, and the Switch version will feature new songs not available in the smartphone version. The Gardens Between is the first PC title from Melbourne-based studio The Voxel Agents, best known for their popular mobile Train Conductor series. "The Gardens Between is an adventure puzzle game about friendship, what it means to grow up, what must be let go what should never be left behind. Best friends Arina, a headstrong girl, and Frendt, a boy wise beyond his years, fall into a lush world of mysterious gardens. The vibrant world grows around objects from their past to form curious combinations of time and imagination. Together they traverse a bittersweet story of friendship where the forwards and backwards traversal of time makes cause and effect malleable. Memories surface as the duo stargaze, illuminating the meaning and depth of their friendship." The game will release for PC and Mac late 2017. It features a vibrant, storybook-like art style; hand-crafted puzzle design in a beautiful 3D world; complete, language-free accessibility design; and a meditative, ambient soundtrack by artist Tim Shiel.